Before Matt's deployment, there was a send-off ceremony. Afterwards, Matt and I were interviewed by the local news. When asked what about home he would miss the most, Matt replied, "The hugs and the kisses." You can imagine the amount of flack he received from the guys he works with. In fact, upon his departure, everyone was handing him Hershey's Kisses and giving him a hug to hold him over. I found it quite sweet that, of all the things he would miss, our affection took first place. As much as my boys and I complain about him being gone, we only have to miss one person. Deployed service members are separated from everyone they love, all of us. The boys and I made a plan so that we can still get kisses from Dad every night. 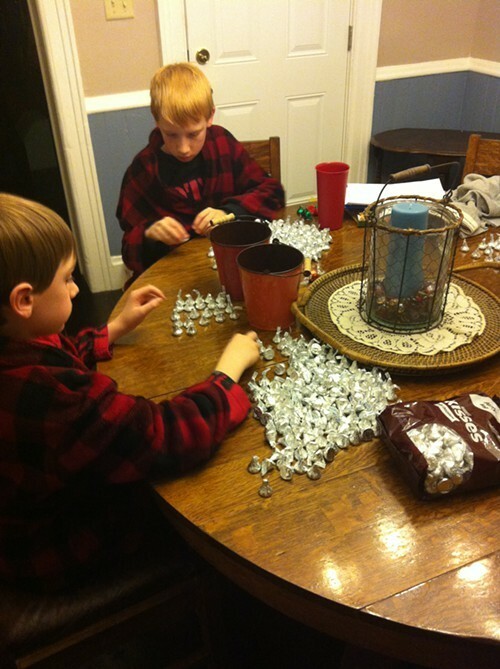 We counted out Hershey's Kisses, one for every night he'd be gone. Each of the boys got his own bucket and filled it right up. Every night after dinner, they take a kiss from the bucket. They love getting a treat at the end of the day and it feels so good to watch the amount of kisses in the bucket get smaller and smaller. A chocolate kiss can't compare with the real thing, but we'll take it for now. We may be tired of chocolate by the time Matt gets home — if that's even possible.